Gurgaon, Delhi Among the World’s Most Polluted Cities It is now being observed that many people are running away from Delhi like refugees or Internally Displaced Persons (IDPs). A new IQAir AirVisual report, which covered 3,000 cities of the world, has revealed that Gurugram (a.k.a. Gurgaon) a suburb of the Indian capital ​New Delhi is the most polluted city of the world while 22 of the top 30 polluted cities are in India. Children of RMN Foundation free schools distributing pamphlets during an environment protection campaign, urging the Delhi government to save them from pollution. But the careless government is not taking any steps to stop pollution. Campaign and photo by Rakesh Raman, founder of the humanitarian organization RMN Foundation. Also, Delhi remains the most polluted capital across the world in 2018, as per a study conducted by the environment-protection organization Greenpeace. The air quality in the national capital region has been constantly deteriorating. The IQAir AirVisual 2018 World Air Quality Report reveals that in South Asia, out of 20 most polluted cities in the world, 18 are in India, Pakistan, and Bangladesh. An interactive tool on the Breathe Life 2030 website shows a Particulate Matter (PM) 2.5 level of 143 micrograms per cubic metre (annual mean) in India’s capital New Delhi. This is over 14 times more than the WHO (World Health Organization) safe level of 10 µg/m3. It is now being observed that many people are running away from Delhi like refugees or Internally Displaced Persons (IDPs). As a result, India is falling in the category of countries with large IDP populations – such as Syria, Colombia, Iraq, Congo, Sudan, Nigeria, and Somalia. Construction and Pollution in Delhi You can​ click here​ to study a report on the harmful effect of construction on environment in India’s capital New Delhi. UN Environment Report Urges to Improve Air Quality UN Environment partnered with the World Health Organization (WHO) to host the first global meeting on air pollution. practices, advocating action and bringing together governments, civil society and businesses once again proved critical.” The report, released online ahead of March 2019’s UN Environment Assembly, shows that the pace of action on many interlinked environmental issues is accelerating. World Environment Day 2018 inspired action on plastic pollution, reaching hundreds of millions of people in over 190 countries as India pledged to phase out single-use plastics by 2022. UN Environment partnered with the World Health Organization (WHO) to host the first global meeting on air pollution​, which kills millions of people each year, while supporting nations to improve air quality through electric mobility, fuel efficiency, and much more. Organizations and countries - convened by UN Environment - came together to save the Cuvette Central Peatlands in the Congo Basin, which is home to 14 globally threatened species and stores the carbon equivalent of three years of global greenhouse gas emissions. The report shows UN Environment’s impact in many other areas, including making the cooling industry more climate-friendly, helping communities in Darfur to reduce resource conflicts in a changing climate, and training authorities so they can better enforce environmental laws. The online report will also integrate with the Programme Performance Report, a comprehensive review of the programme of work agreed with Member States. Artificial Intelligence Drives Volvo Autonomous Electric Bus The bus comes with a Volvo autonomous research software that is connected to key controls and multiple sensors. Volvo Buses and Nanyang Technological University (NTU) in Singapore have demonstrated the world's first 12-metre autonomous electric bus​. The Volvo bus will soon begin trials on the NTU campus. The 85 passenger Volvo 7900 Electric bus is equipped with sensors and navigation controls that are managed by a comprehensive artificial intelligence (​AI​) system. Ensuring maximum safety and reliability, the AI system is also protected with cyber security​ measures to prevent unwanted intrusions. According to Volvo, the Volvo bus has undergone preliminary rounds of rigorous testing at the Centre of Excellence for Testing and Research of Autonomous Vehicles (CETRAN). Plans are in place to test the bus on NTU campus and to extend the route beyond the university. The fully autonomous electric bus provides a quiet operation with zero emissions. The company claims that it requires 80 percent less energy than an equivalent sized diesel bus. This is Volvo's first autonomous fully electric bus in public transportation. "Our electric bus featuring autonomous technology represents an important step towards our vision for a cleaner, safer, and smarter city,” said Håkan Agnevall, President, Volvo Buses. The bus comes with a Volvo autonomous research software that is connected to key controls and multiple sensors. NTU researchers have enhanced it with an AI system that communicates with sensors, enabling the bus to operate autonomously. This includes light detection and ranging sensors (LIDARS), 360-degree cameras, and an advanced global navigation satellite system that uses real-time kinematics. This is like any global positioning system (GPS), but uses multiple data sources to give pin-point location accuracy up to one centimetre. The system is hooked-up to an "inertial management unit", measuring the bus's lateral and angular rate. This will improve the bus's navigation when going over uneven terrain, ensuring a smooth ride. Volvo Buses is one of the world's leading bus manufacturers, with a focus on vehicles and systems for long-term sustainable public transport. Volvo Buses is part of Volvo Group. FAR Construction, Corruption, and Pollution in Delhi FAR construction is spreading lethal dust and noise pollution in India’s capital New Delhi. Click here to download and read the full report on FAR construction. Lethal Pollution Killing People in Delhi The extreme pollution in Delhi is being compared to the poisonous gas chambers used by Nazi Germany during the Holocaust for the genocide of millions of European Jews. 8. The extreme pollution in Delhi is being compared to the poisonous gas chambers used by Nazi Germany during the Holocaust for the genocide of millions of European Jews. 9. As pollution in Delhi / India is harmful to millions of Indians as well as people in other parts of the world with its impact on global warming and climate change​, its lethal effect is equivalent to weapons of mass destruction. 10. The Indian government including bureaucrats and politicians are causing serious environmental damage which is harmful for the entire planet. Therefore, the global community including the UN and the U.S. Department of State and the Office of Foreign Assets Control (​OFAC​) must impose strict economic, diplomatic, and trade sanctions on India. The Indian ministers, politicians, and top officials must be punished with travel bans on them and freezing of their assets, and they should be declared as environmental terrorists. Dust Pollution As construction dust includes cement particles, it is more harmful than ordinary dust in the atmosphere. If ​construction activity is carried out in localities where people live, dust pollution will cause serious, incurable diseases among them. The diseases include irritation in eyes, skin rashes, coughing, sneezing, hayfever, asthma attacks, and amnesia. Water Is a Human Right. But 2.1 Billion People Live Without Safe Water By 2030, an estimated 700 million people worldwide could be displaced by intense water scarcity. their inclusive management if we are to protect and use this vital resource sustainably for the benefit of all people,” the Secretary-General said. UN Environment Looking for Young Champions of the Earth Each winner will be expected to implement their big idea by producing videos and blogs. Young Champions of the Earth aims to celebrate and support individuals aged between 18 and 30 who have the potential to create a positive​ environmental​ impact. According to UN Environment, global warming is forcing our societies, our economies, and our world to change. Our ways of doing business; careers and job opportunities need to change too. In 2019, seven young people – selected from every global region – will be named Young Champions of the Earth. These winners receive seed funding, intensive training, and tailored mentorship to bring their big environmental ideas to life. UN Environment is looking for the artists, scientists, economists, communicators, and entrepreneurs from all walks of life with ideas for the environment, for humanity, and for a greener future. Following an open call for applications, UN experts will shortlist World Finalists from every region. A Global Jury will then select the seven 2019 winners. Each winner will be expected to implement their big idea by producing videos and blogs. In parallel, up to 50 of the most promising applicants will be granted privileged access to an expert community of Covestro mentors. They will offer insights on topics ranging from communications and business development to project planning and financial management. Click​ here​ for details. 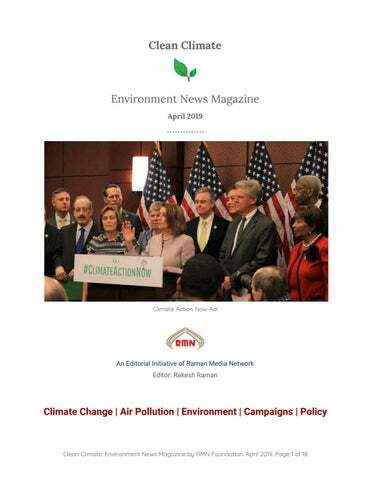 U.S. House Democrats Introduce Climate Action Now Act The legislation would call on President Trump to develop and make public a plan for how the United States will meet the pollution reduction goals submitted to the world. on the climate crisis by ensuring America honors its Paris Agreement commitments and laying the groundwork for further action. “I am proud to be chairing the Select Committee on the Climate Crisis and I am honored to introduce H.R. 9, the Climate Action Now Act,” U.S. Rep. Castor said. “It was with America’s leadership and engagement that so many nations committed to climate action in the international Paris Agreement. Despite what President Trump has said, America cannot and will not retreat. We will keep our commitments to fight the climate crisis. This is just the start of action by House Democrats in this Congress.” “Today, the House Democratic Majority is honoring the will of the people and taking first strong steps to protect our planet and our future. The bill – this is about jobs. It’s about good-paying green jobs. It’s about advancing our economy and our global preeminence in green technology. It’s about health, it’s about public health and clean air and clean water for our children,” said Speaker​ Nancy Pelosi​. On December 12, 2015, nearly 200 countries, including the United States, China, India​, and the European Union signed the Paris Agreement to combat climate change and to accelerate and amplify the actions and investments needed for a sustainable low carbon future. On June 1, 2017, President Trump announced his intention to withdraw the United States from the Paris Agreement – making America the only country to reject the global pact. The Climate Action Now Act would prohibit any federal funds from being used to take any action to advance the withdrawal of the United States from the Paris Agreement. The legislation would also call on President Trump to develop and make public a plan for how the United States will meet the pollution reduction goals submitted to the world in 2015. Environmental Report Warns of Millions of Premature Deaths The sixth Global Environmental Outlook has been released while environmental ministers from around the world were in Nairobi. The most comprehensive and rigorous assessment on the state of the environment completed by the UN in the last five years was published on March 13. It warns that damage to the planet is so dire that people’s health will be increasingly threatened unless urgent action is taken. The report, which was produced by 250 scientists and experts from more than 70 countries, says that either we drastically scale up environmental protections, or cities and regions in Asia, the Middle East and Africa could see millions of premature deaths by mid-century. It also warns that pollutants in our freshwater systems will see anti-microbial resistance become a major cause of death by 2050 and endocrine disruptors impact male and female fertility, as well as child neurodevelopment. But the report highlights the fact that the world has the science, technology, and finance it needs to move towards a more sustainable development pathway, although sufficient support is still missing from the public, business, and political leaders who are clinging to outdated production and development models. The sixth Global Environmental Outlook has been released while environmental ministers from around the world were in Nairobi to participate in the world’s highest-level environmental forum. Negotiations at the Fourth UN Environment Assembly are expected to tackle critical issues such as stopping food waste, promoting the spread of electric mobility, and tackling the crisis of plastic pollution in our oceans, among other pressing challenges. UN Report on Climate Change Is Wake-Up Call to the World: UN Chief Mr. Guterres called on Heads of State to attend his climate action summit in New York on 23 September, and achieve positive change. he said, adding: “This is what science says is needed. It is what young people around the globe are rightfully demanding.” The data released in the report gives cause for great concern. The past four years were the warmest on record, with the global average surface temperature in 2018 approximately 1 °C above the pre-industrial baseline. This data confirms the urgency of climate action. This was also emphasized by the recent Intergovernmental Panel on Climate Change (IPCC) special report on the impacts of global warming of 1.5 °C. The IPCC found that limiting global warming to 1.5 °C will require rapid and far-reaching transitions in land, energy, industry, buildings, transport, and cities, and that global net human-caused emissions of carbon dioxide need to fall by about 45% from 2010 levels by 2030, reaching “net zero” around 2050. Bengaluru Joins the BreatheLife Campaign to Stop Pollution Air quality in the city is continuously monitored by the Karnataka State Pollution Control Board in a number of locations throughout the metropolis. Bengaluru (a.k.a. Bangalore), which is the capital of India's southern state Karnataka, has become the first Indian city to join the​ BreatheLife​ campaign. With this decision, this megacity of 8.4 million people commits to reducing air pollution (including climate pollutants) in key sectors, like transport, municipal solid waste, industry, and energy production. The city’s government, the Bruhat Bengaluru Mahanagara Palike, also has drawn up detailed plans to construct bicycle lanes on over 100km of roads. The government encourages city residents to use bicycles for shorter distance, but also to support first- and last-mile connectivity, as some of the roads earmarked for bike lanes are connected to metro stations. Air quality in the city is continuously monitored by the Karnataka State Pollution Control Board​ in a number of locations throughout the metropolis. According to a BreatheLife report​, the city is also focused on better management of its solid waste, a significant quantity of which is currently burnt. The report reveals that Bengaluru produces about 4,200 to 4,500 metric tonnes of solid waste every year. The city has established 189 dry waste centres to segregate waste at source and taken action to install semi-underground waste collection bins in 200 busy commercial locations and city markets. Bengaluru also has procured 25 large capacity mechanical sweepers that have been installed in 13 locations and established seven waste processing plants with the capacity to process 2,300 tonnes of waste. The editor of ​Clean Climate environment news magazine ​Rakesh Raman is a national award-winning journalist and social activist. Besides working at senior editorial positions with leading media companies, he was writing an exclusive edit-page column regularly for The Financial Express (a daily business newspaper of The Indian Express Group). Nowadays, for the past about 8 years, he has been running his own global news services on different subjects. He also has formed a free Education and Career Counselling Center for deserving children at a poor J.J. Colony in Dwarka, New Delhi under his ​NGO – RMN Foundation. He runs an exclusive community-driven anti-corruption social service “​Clean House​” to help the suffering residents of Delhi raise their voice against the growing corruption and injustice. He also has formed an environment-protection group called Green Group in Delhi. He creates and distributes a number of ​digital publications that cover areas such as technology, law, environment, education, politics, corruption and transparency. He has created a comprehensive online information ​service to educate the Indian voters for the 2019 Lok Sabha election. Earlier, he had been associated with the United Nations (UN) through United Nations Industrial Development Organization (UNIDO) as a digital media expert to help businesses use technology for brand marketing and business development.